Plants up to 50cm high, native in Asia from India to Indonesia, cultivated throughout Indo-China; rhizomes bright yellow, ovoid-globose, strongly aromatic; leaves 3-4, leaf sheath red; leaf blade green on both surfaces, ovate-oblong or elliptic-lanceolate, 25-50cm long, glabrous except for sparsely hairy midvein abaxially; inflorescences terminal on pseudostems, appearing from within apical leaf sheaths, bracts lanceolate, 4-5cm; flowers aromatic, calyx 1.5-2cm, corolla pink, corolla tube 4.5-5.5cm; lateral staminodes light pink, labellum white or pink with purple stripe, fiddle-shaped. „Fingerroot has a strong, dominating flavour that I would, lacking a better term, classify as „medical“… Fingerroot is used as a medicine, not for cooking, in China, and it is a rare spice in the cuisines of Vietnam and Indonesia: I have seen it appearing in markets in, e. g., Saigon [Sài Gòn] or Bukittinggi, but corresponding cookbooks usually do not mention it. In traditional medicine, rhizomes and roots are used in post-partum tonic mixtures (such as the popular Indonesian tonic, ‘jamu’), as a stomachic (to improve appetite and digestion) and carminative (to aid digestion and reduce gas) and as a remedy for coughs and mouth ulcers. 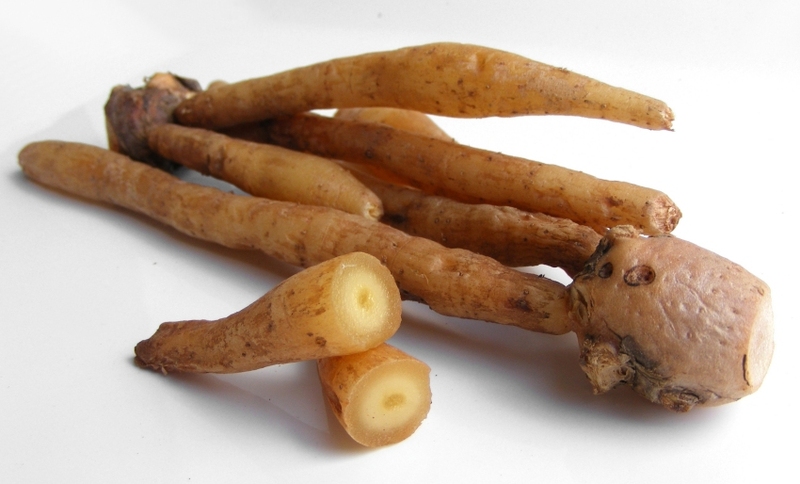 Crushed rhizomes and roots are also applied externally to treat rheumatism. Major constituents of the essential oils of the rhizomes were camphor (16.1-32.1%), geraniol (16.2-26.0%), (E)-β-ocimene (19.0-23.7%), 1,8-cineole (7.5-13.9%), camphene (5.4-6.0%) and methyl cinnamate (2.2-5.8%).